My senior year in high school, we were required to write a research paper on a modern hero. I can’t remember the exact parameters used to determine “modern,” but Mother Teresa qualified, since she had only died a few weeks before the assignment was announced. In order to prevent what was sure to be a rush of Mormon kids choosing Gordon B. Hinckley, the rule was made that only one person in the class could write about a particular hero. The teacher started at one side of the classroom and just pointed to students in order, making a note of what students had said. There were a lot of religious kids in the class, and, other than sports stars and Princess Diana, religious figures were prominently chosen (it’s a good thing there are plenty of LDS apostles, in addition to the prophet). But I admired Mother Teresa. I thought she was amazing, living among the poor and making so many efforts for good in the world. Today, I don’t agree with all of the sentiments she expressed on various issues, but I still think she was an amazing woman.
. Those letters weren’t public at the time. Now, though, they are public (and have been for the better part of a decade) — and they reveal something interesting about Mother Teresa. She doubted the existence of God. While she remembers feeling as though God had called her to work, and while she had experiences of closeness to God, she also had a decades-long feeling of abandonment and even wrestled with the idea that God doesn’t exist. 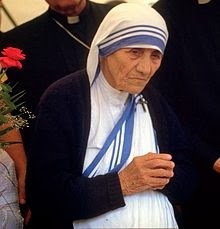 I’ve been thinking a lot about Mother Teresa and her struggle. Some might think that it’s hypocrisy to keep working in the name of Jesus, and proclaim Him while having private doubts, but I really don’t have a problem with that. If anything, it makes me admire her a little more. She kept calling to the divine, even through her doubts. And it illustrates the altruism of her work with the poorest of the poor, since there were times when she didn’t even have the hope of heaven as a reward. My thoughts have turned to Mother Teresa because sometimes I struggle with my own belief. I know that our brains are wired for God, and for experiences that support conversion and feelings of closeness with divinity. And there are days that I ask myself what I believe. Especially when I consider whether or not what I think, feel, believe, hope for, want, or whatever matches up with some of the stuff that’s being taught. Do you just carry on even with the emptiness? Many of the trappings are still observed, from scriptures to prayers to tithing. But sometimes I feel bad when I’m teaching primary. Do I really agree with what I’m saying? So far, I’ve managed to get through it with mildly subversive, but still doctrinally sound, items. Also, I have faith enough that I’m not ready to work toward tearing down someone else’s faith. I have issues with certain aspects of the culture of Mormonism. But I’m not sure that’s enough for the whole leaving it behind thing. Is because I feel a kernel of truth? Or is it so much a part of my identity? Or am I just going through a bit of a rough patch? We all have doubts; that’s the nature of faith. The real question is whether or not we overcome them. Or is the question whether we should overcome them? Mother Teresa carried on with everything weighing on her, and found a measure of comfort in her work. Maybe that’s enough for now.